"These people mean nothing," her father says. "They cannot even begin to grasp what it is they think they see and hear, and it is easier for them to believe they are receiving miraculous transmissions from the afterlife. Why not take advantage of that, especially when they are so willing to part with their money for something so simple?" Interesting teaser! I have been meaning to read this book but haven't had a chance yet. My teasers this week are from A Perfect Blood by Kim Harrison and Divergent by Veronica Roth. Happy reading! This has been in my TBR list for quite a long time now! Awesome teaser! The thing I loved the most about The Night Circus was the gorgeous descriptions. Planning to read this one this year. Excellent teaser! Great teaser. 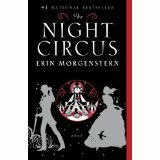 I have this on my TBR list and hopefully will get to read it soon. Thanks for sharing, I'm going to bring it up the list. Happy reading. Good teaser! Hopefully I will get to this book at some point. I really like your blog.